By engaging with the greatest minds from history in the formation of ideas and embarking on this journey with like-minded peers, I've entered a learning tradition that pursues truth, goodness, and beauty with genuine care and desire to impact the world for the better, in whatever career I choose. Our partnership with Christian Heritage College (CHC) provides students access to classes with talented, Christian, liberal arts faculty. CHC offers undergraduate and postgraduate degrees in liberal arts through their version of an honours college called The Millis Institute. Dr Ben Myers is Director of the Millis Institute. Originally from North Queensland, he studied literature at CHC before doing Honours and a PhD at James Cook University. 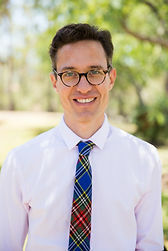 He has been a research fellow at the University of Queensland, a lecturer at Charles Sturt University, and a visiting scholar at Fuller Seminary and the Center of Theological Inquiry in Princeton. His books include Milton’s Theology of Freedom, Christ the Stranger, and The Apostles’ Creed: A Guide to the Ancient Catechism.